MyPoints Daily Rewards Program: Legit or Scam? But hold on. Don’t jump the gun. No two rewards sites are the same. They offer a wide variety of incentives at different rates and for doing different tasks. That’s why we delved deep into MyPoints, looking through all that they offered and whether it’s worth it for you to consider. 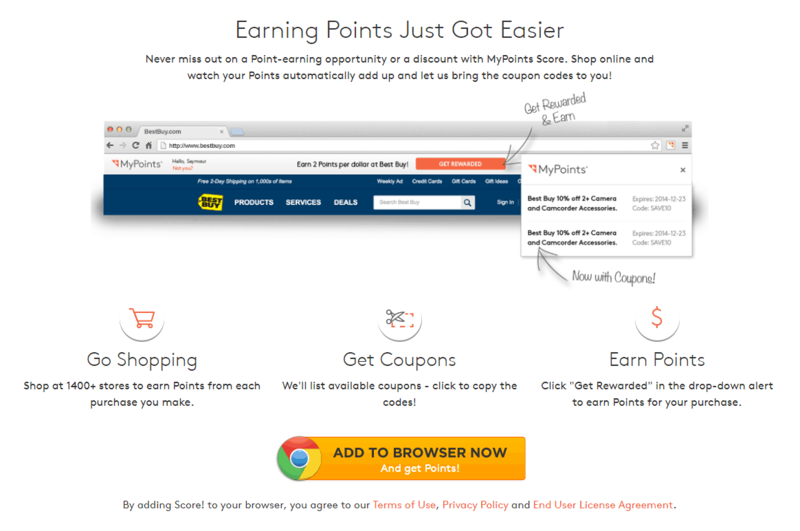 MyPoints is a rewards website that gives you points for doing a bunch of different tasks. You can then exchange those points for cash or prizes. And that’s what this MyPoint Review is for — to answer those burning questions. There are three main MyPoints rewards you can earn: gift cards, cash, and travel miles. Later, we’ll get into how to earn this rewards. But before you get deep into this site, let’s look at what you can earn. Right now, there are 85 different types of rewards you can earn through MyPoints. All of the rewards actually come in the form of gift cards but are for certain places or cash values. So for example, you can get a gift card to Amazon or Dell, a Visa Prepaid card, or a gift certificate for travel miles with American Airlines or United Airlines. You can also get coupons for grocery stores and points for printing out the coupons. It’s a task and a reward bundled into one. And the ways you earn points are almost as many as the rewards offered. You can sign up for an account today and get started in earning some awesome rewards. How Can You Make Money With MyPoints? You’ve got plenty of options for earning rewards, so it’s just a matter of taking your pick. And right now, one MyPoints point equals about half of a penny ($0.006). But they add up quick! This is when you get points just for clicking on the BonusMail they send you after signing up. Basically, they send you emails with links. If you click those links, you earn 5 points, or about $0.035. And it probably takes about 15 seconds to click through one email, so that ends up being a little over $8 an hour. MyPoints partners with nearly 2,000 online retailers. And if you shop at those retailers’ websites through MyPoints, you get cash back that’s equivalent to a percentage of each purchase. Even though the cash back rewards are not as good as some of the more well-known shop-for-rewards sites, like Ebates or Swagbucks, they’re still not bad. For example, shopping at Wal-Mart through the site gets you 8 points per dollar you spend — that’s $0.05 cash back per dollar or 5%. The highest cashback reward I could find was 15 points per dollar ($0.09 / 9% per dollar spent). That’s good, but still, contrast that with Ebates claim of giving you up to 40% cash back. One feature related to the shopping aspect is MyPoints Score. It’s an extension you add to your browser that tracks where you shop and what you buy and awards you points accordingly. So instead of going through MyPoints’ site everytime you want to buy something online, you can just add this browser extension and MyPoints comes with you wherever you go. Using either a computer or your smartphone, you can get points just for watching videos — the videos I saw included one about Kanye West’s return, world and celebrity news, and cooking how-to videos. What you can do to make money fast and with little effort is to play the videos in one tab while you take paid surveys in another. That way, you’re earning points on top of points. Using MyPoint’s built-in Yahoo! search tool you have a chance to win something instantly, even though they don’t make it clear what you would win or how that’s even calculated or decided. But, hey, if you’re going to search the web for something, you might as well bookmark their Search And Earn page and use it instead of Yahoo!’s search page. You can also earn money by using coupons — that’s cash back on top of savings. Just print out coupons from the website and use them at your local chain stores and you’ll get points. You can earn 10 points each time you print out a coupon, which comes to about six cents cash back for every coupon you print, not including the savings the coupon provides. If you’re a gamer, you may be interested in playing games in exchange for points. This can be a nice option if you like to chill out with video games — because then you can literally earn money while you relax. If you refer a friend to join MyPoints, you can expect a few waves of rewards to hit you. First, you’ll get 25 points just for referring somebody who then signs up. Then once that person spends $20 or more shopping through MyPoints, you get 750 points. Plus, you’ll start getting a 10-percent equivalent of any points they earn. And get this — you have unlimited invitations. Like a lot of the best rewards sites, you can get paid to share your opinion by completing the daily poll and the surveys. MyPoints does this because your answers contribute to their market research program. Any survey you’re qualified for shows up in your inbox, and you’ll get paid 50 points after completing one. Each survey takes about 10 minutes, which equals roughly $0.35 (just over $2 per hour). In the top-right corner of the site, you’ll see an “Easy Points” tab. This is where MyPoints asks if you need a contractor for your home, or if you’d like to save money on groceries by using coupons. Simply hit “I don’t” and they’ll show you a link that you can click to earn points. If you do this once a month, you’ll get 5 points ($0.035) each time. 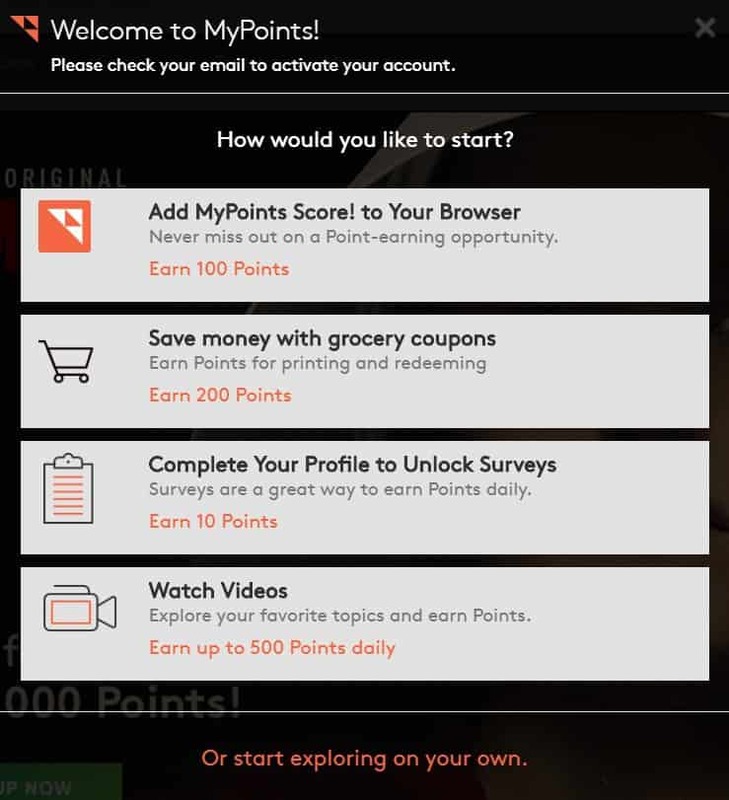 Like most rewards sites, MyPoints is free to join. As is typical, you’ll have to confirm your email address, but MyPoints also offers a bonus right after you sign up. In the email asking you to verify your email address, they offer a $10 gift card once you spend $20 or more of qualifying purchases in your first 30 days. For the most part, it’s an easy signup process. And there’s even a MyPoints app for those who do everything from their phone. (Note: you do have to be a U.S. or Canadian citizen and be at least 18 years old to sign up). 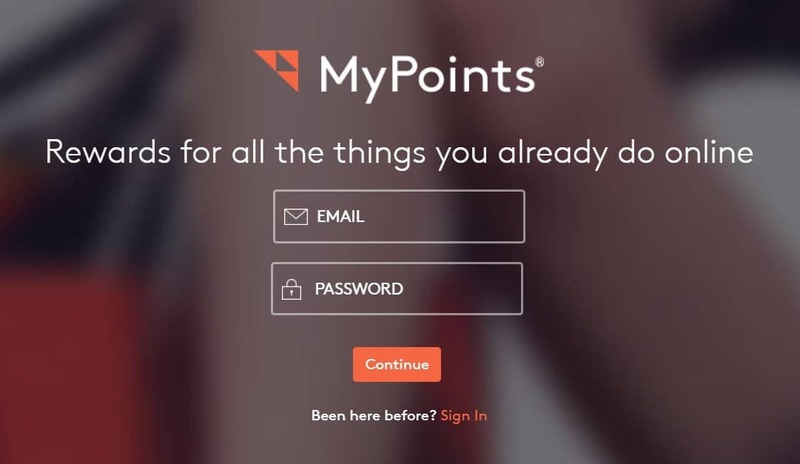 Right after you sign up and sign in for the first time, MyPoints shows you a pop-up to help get you started, offering to direct you to print coupons, watch videos, and take surveys. Some people ask, “Is MyPoints safe to use? Is it legal?” Yes absolutely, it is a legit way to make money online. It’s not a scam. Could you make it your full-time, work-from-home job? No, but it could be an easy way to make some pocket change in your free time. Survey sites are a good fit for people who have some downtime and want to earn money while doing fun things, like watching videos, playing games, and taking surveys. We like to call it mindless money making. And if you’re already using online surveys as a side hustle, you should certainly consider MyPoints. Caleb Murphy is a freelance writer and contributor to The Savvy Couple. He is excellent at finding clever ways to making extra money each month to fuel is other passions. Have you tried an online reward & survey site? Join our FREE Facebook group for more ways to earn extra income!